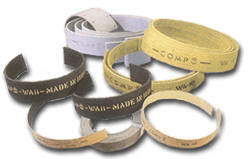 Industrial Roll Linings, Flexible and Woven roll linings by Hindustan Composites Limited. Industrial woven and flexible roll linings with and without wire reinforcement in various thickness and lengths are another speciality of HCL. Their applications are in segments or as band brakes in elevators, cranes, winches, hoists, drop hammers, concrete mixers, heavy earth moving equipment and in dry and oil immersed conditions. Quality references : WA-8, WA 10, Magma 23, WA18, Compo Gold.